I’ve seen a few curried chicken salad recipes floating around on Paleo and Whole30 blogs, so on a grocery run last week, I picked up a rotisserie chicken to make one. This is a great way for someone living/dining alone to get rid of the other half of that chicken (we’re talking 2-or-so-pound Kroger chickens here, not 4- or 5-pound Costco or Sam’s pterodactyls). If you don’t have a rotisserie chicken but do have some chicken breasts in the freezer, cook them by simmering them in a pot with chicken broth, salt, pepper, garlic powder, and onion powder until cooked through. Whether cooking your own chicken or using a store-bought rotisserie bird, refrigerate at least 4 hours, preferably overnight, so that it’s fully chilled when you’re ready to start working with it. Click here for a printable PDF of this recipe. In the large bowl, combine mayo, curry powder, salt, pepper, cilantro, and onion powder. Stir well to combine; set aside. Core and chop apple into ½-inch chunks (it’s up to you whether or not to peel it first). Place apple chunks into the small bowl with lime juice and toss to coat to keep apples from browning. If using a rotisserie chicken, remove skin and pull meat from the bones, making sure to remove any small bones or cartilage. 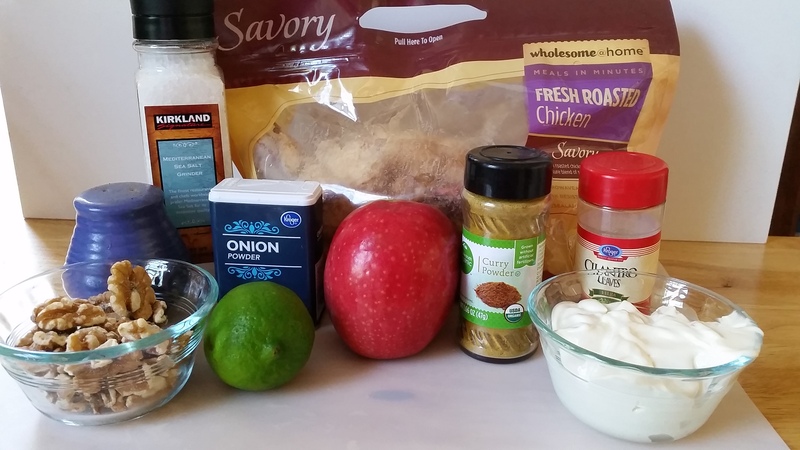 Roughly chop chicken into bite-sized pieces and add to mayo mixture in large bowl. Add apples and lime juice and stir until chicken and apples are completely coated. You can stir in walnuts or use them as a garnish on top for serving. I have to admit, the addition of the curry powder did nothing for me. Without it, this is a decent chicken salad recipe. If I’d had grapes, I’d have added those to it as well (my favorite chicken salad, from Rafferty’s, includes grapes). If you’re not worried about sugar content, it would have been excellent with Craisins in it. This entry was posted in Food Journal, Low-Carb, My Wholesome 30, Recipes. Bookmark the permalink. 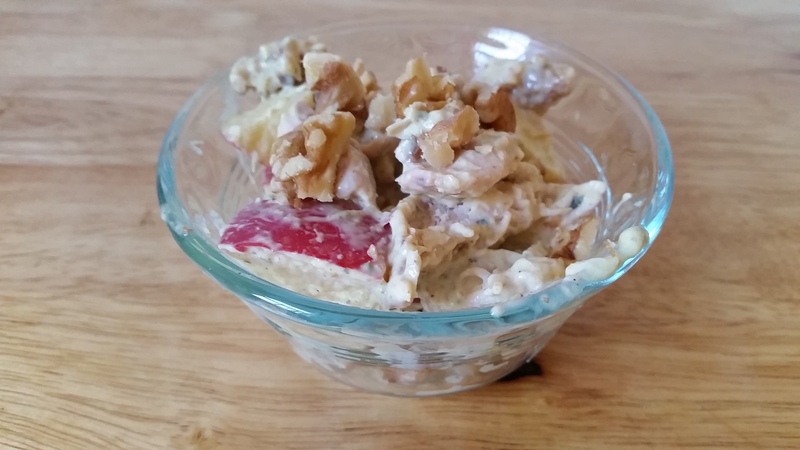 Yep, I use the Craisins, walnuts, apple, mayo, a touch of Tony’s Bold for a spin on Waldorf salad. One of my favorite ways to have a great snack in the afternoon. Nothing wrong with adding chicken to that. Sounds yummy and I don’t much care for chicken salad.